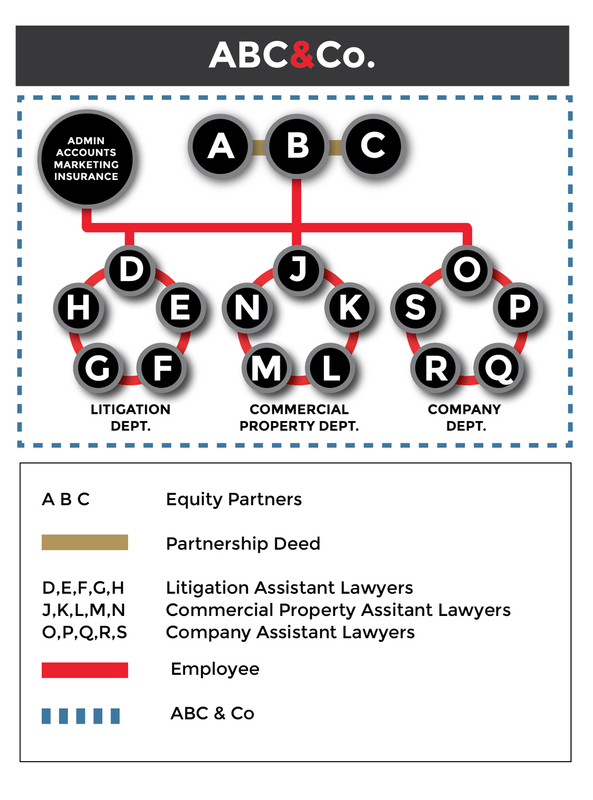 The Lawyers Inc. model enables a legal department to leave its current firm en-masse and re-structure under the Lawyers Inc. umbrella. The senior transferring members of that department will operate as our consultants and retain up to 80% of the billing of the transferring team of lawyers, which we call a ‘pod’. In return Lawyers Inc. provides the new pod with the services set out below. The model’s flexibility enables lawyers to choose whether they wish to become consultants or employees and is designed to facilitate the ambitions of each set of lawyers to expand their pod. Lawyers Inc. encourages each pod to independently pursue a sustained program of growth, the pace of which, is determined by the members of the pod. Let’s suppose, J and K are Senior lawyers, aged 45 and 55 and are in charge of the Commercial Property Department which includes the more junior lawyers L,M,N aged between 25 and 35. Currently all the lawyers are assistant lawyers of the firm, ABC & Co. This department may elect to leave ABC and Co, and set up an independent unit which we call a ‘pod’ under the Lawyers Inc. umbrella. J and K will become Consultants and L,M,N, employees with Lawyers Inc. The unit could earn up to 80% of its total billing. Alternatively, J and K may leave ABC & Co. and employ alternative lawyers for their pod. The first Contracts are separate and identical Consultancy Agreements between Lawyers Inc. and new Co. J and new Co. K. respectively entitling them to receive up to 80% of the gross fee billing of the legal team (which we call a Pod) in the future, subject to the deductions set out below. 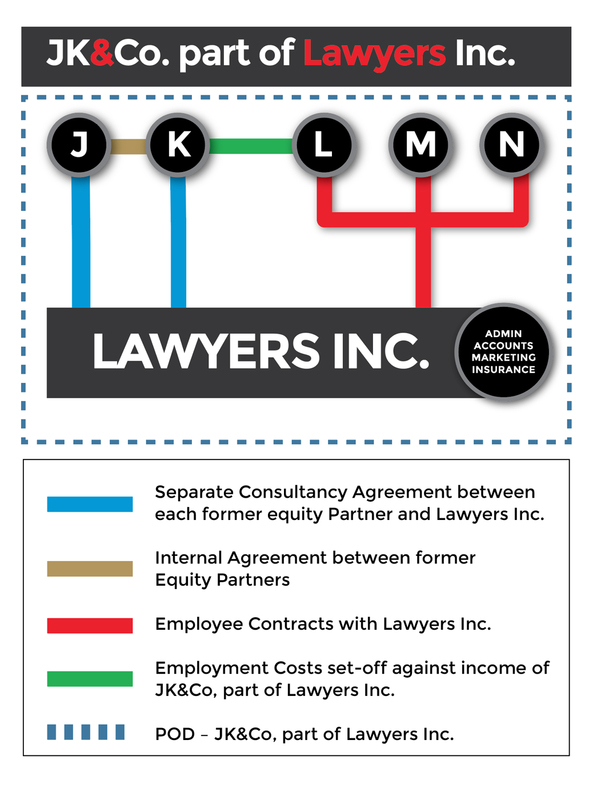 The second Contract, we call an Internal Agreement (IA), is an Agreement between the new companies J Ltd and K Ltd, detailing how the gross fee income proceeds are to be divided between them. J and K may request Lawyers Inc. to retain the service of non-fee earning support staff such as a favourite PA or receptionist but that would be re-charged. Following execution of contracts, the new Pod, JK and Co. part of Lawyers Inc. will seamlessly continue to practise under the auspices of Lawyers Inc. (the commencement date). It is important to note that all the Consultants are paid monthly based on client bills paid. Lawyers Inc. will continue to pay the previous salaried fee earners on the same basis as before. These will be then charged back on your monthly statements. J and K will become Consultants with Lawyers Inc. and L,M,N will become employees with Lawyers Inc. The unit could earn up to 80% of its total billing.